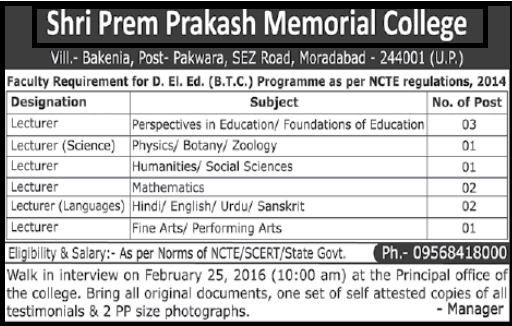 Shri Prem Prakash Memorial College, Bakenia, Pakwara, Moradabad, Uttar Pradesh (U.P) going to conduct a walk-In-Interview on 25th February 2016 (10:00 A.M) at the Principal Office of the College to recruit 10 Lecturer in various subjects . Interested candidates those who want to get Guest Lecturer (Contract basis) jobs in Shri Prem Prakash Memorial College (SPPMC, Moradabad) must bring all original documents , one set of self attested copies of all testimonials & 2 PP size photographs . All the best. must like our Jobrule Facebook Page to get all latest & upcoming Job notification.